Over the next few weeks, your baby will take on more of the appearance of a newborn. The joints and bones of the hand are still very soft, although the cartilage skeleton is now gradually being replaced by bone. This image shows well the numerous capillaries supplying blood to the hands, right down to the fingertips. Your baby’s eyelids and eyebrows are well developed by this week of pregnancy, but the eyelids remain fused. 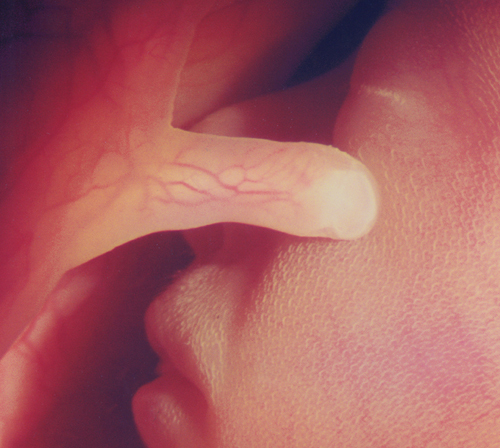 The cells that are destined to become your baby’s fingernails were present at 10 weeks, and the cells for the toenails were present four weeks later. Now, at 23 weeks, the nails are just beginning to make an appearance at the base of the nail bed. The nails will grow continuously throughout life, but it will be several weeks before they have reached the tips of the fingers and then the toes. Your baby’s skin is developing quickly and often appears wrinkled at this stage; it is as if the baby has yet to grow into it. Your baby is now covered in extremely fine and short hairs, known as “lanugo.” This layer of hair will be almost completely lost before birth. The hairs help trap vernix onto the surface of the skin; this is the white, greasy layer that you often see in patches on a baby’s skin at birth. It collects in the skin folds and creases and helps protect the baby’s skin not only from the water content of the amniotic fluid, but also the waste products within it. As your pregnancy advances, your baby’s kidney function is improving and the amniotic fluid produced becomes increasingly similar to urine in its composition. Your posture will naturally change as a result of pregnancy; this is due to the extra weight you’re carrying and the softening of your joints. Prior to pregnancy, your center of gravity was directly over your hips; during later pregnancy it shifts forward to your enlarged abdomen. This dramatic shift in your center of gravity increases the curve of your lower spine, and can result in lower back pain . The weight you gain during pregnancy can also put strain on the back. Do abdominal exercises , to strengthen the core muscles, as well as back stretches. These help maintain good posture and avoid back pain later in pregnancy. Be aware of the way you’re walking and standing: pull your shoulders down and back, do not arch your lower back and keep your pelvis in a neutral position. Avoid balancing anything on your hip, because this can affect your hip and back alignment. Don’t hold a phone between your head and shoulder because this can result in neck pain. Your growing abdomen affects the curvature of your spine. Practice tilting your pelvis to lengthen your spine. Strong abdominal muscles are beneficial during pregnancy because they will help you carry the weight of your baby and assist you during labor and birth. Abdominal exercises done while lying on your back aren’t recommended after the first trimester. The reason for this is that when you lie on your back, your enlarged uterus presses on one of your major blood vessels, reducing the amount of blood pumped around the body and to the baby. However, you can strengthen abdominal muscles without lying on your back by using gravity and your body to strengthen and tone the torso. In pregnancy, you can tone your abdomen with exercises where you adopt an all-fours position or an upright sitting position. Try to do the exercises below around 2–3 times a week. The sling Get down on all fours with your hands on the floor, feet apart, and arms straight. Keep your back flat in a neutral position, being careful not to arch your back. Imagine your abdominal muscles as a sling holding your baby. Take a deep breath, then slowly pull your abdominal muscles (the sling) in toward your back, pulling the baby closer to you, and gently release, returning to the starting position. Repeat at least 20 times. Remember to breathe properly while doing this exercise, breathing in to start and breathing out as you pull in your belly. The superman pose This exercise will strengthen your core muscles, keeping your abdomen and back strong, and helping prevent lower back pain. It also stretches your leg and arm muscles. Start from an all-fours position. Keeping your back in a neutral position, lift your left arm in front of you and your right leg up behind you. Be careful not to arch your back or lift your leg higher than the hips. Hold for a count of five and slowly lower. Then repeat with your right arm and left leg. Do around 10 repetitions for each arm and leg. Strong abdominal muscles enable your body to work more efficiently in labor. They also help support the weight of the baby, which takes pressure off the spine, reducing the likelihood of backaches. In addition, keeping your abdominal muscles strong means that you may be less likely to get a condition called diastasis recti, in which the abdominal wall muscles separate, often following childbirth. making it harder to regain your figure. The abdominal pull This can be done anywhere and at any time. It’s advisable to start by doing it sitting in an upright chair with your shoulders relaxed and back straight. Put your hands around your belly below your navel. Breathe in slowly and pull in your abdominal muscles for two seconds and then release; repeat 10 times. Take a short break, then start again. Once you’ve mastered this, move on to the next level. In the same position, pull in your muscles and release quickly, almost every second. Breathe properly and do not hold your breath.